The University of Wyoming can credit dairy cows for two of its more prolific weed science experts. Outstanding Alumni Award recipient Phil Stahlman didn’t want any part of his family’s northwest Oklahoma dairy after high school. His two older brothers were more interested, and Stahlman was more enthusiastic about crops. A little over 400 miles away in northern Colorado, soon-to-be lifelong friend and professional peer Steve Miller looked at HIS family’s dairy farm and thought the same thing. They would meet as fellow weed science graduate students at North Dakota State University and 13 years later, Miller would be Stahlman’s Ph.D. adviser at UW. 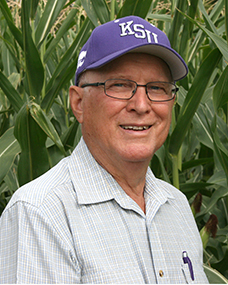 Stahlman retired this February after working his first three years at North Dakota State University at Minot, then two years at Hesston, Kansas, for Kansas State University, then 40 years at KSU’s Agricultural Research Center at Hays, Kansas. One nominator for the award noted Stahlman’s research and his ability to communicate those findings to a lay and scientific audience. His work has been recognized nationally and internationally. Moving from Master’s to Ph.D.
Stahlman walked a slower path to his Ph.D. than his friend, Miller. He worked for NDSU those three years before joining KSU, and 10 more before returning to school for his Ph.D. He and his wife, Linda, had sons in the first and fourth grades at Hays. A difficult decision he says, to uproot his family and move to Laramie, but the couple had been discussing the change for some time. “We decided collectively we would make that move. It was an investment in our family and my career,” he says. They celebrated their 48th wedding anniversary earlier this year and have one granddaughter and another grandchild expected in September. Kurt Feltner, a UW alumnus (see related story), was director of KSU research centers at the time. Stahlman was vehement about not pursuing his Ph.D. from KSU. Stahlman and Miller had kept up their friendship, Stahlman earning his master’s degree and Miller his Ph.D. They also collaborated on projects. That friendship and working proved a plus. He’d been a researcher 13 years and didn’t need to learn the how, he says, and was able to operate a little more independently than most graduate students. KSU had granted Stahlman a sabbatical to get his Ph.D. – his job would be waiting upon his return. That proved a double-edge sword, he says, because he kept a skeleton research program at KSU while also conducting research for his UW dissertation. Research project by research project, he built a career of finding ways to improve current or find new weed management strategies. Basic and applied research examined herbicide-resistant weeds, jointed goatgrass, corn herbicides, grain sorghum herbicides, weed control in soybeans, sunflowers, and wheat, and recropping studies to find ways western Kansas farmers could manage their land after drought or other events destroy their winter wheat crop. Kenyon notes Stahlman’s research creativity by investigating alternatives to herbicides, which would result in a U.S. patent. He collaborated with weed scientists in Colorado, Nebraska, and Wyoming to establish long-term field studies to see if using only glyphosate multiple times annually worked for weed control. The research confirmed the risks of continual glyphosate use and the benefits of a diverse herbicide program. In 2007, his graduate student confirmed the first cases of glyphosate resistance in kochia. Another graduate student confirmed multiple resistance in kochia to glyphosate and dicamba herbicides. From 2012 to his retirement, Stahlman documented the distribution of glyphosate resistant Palmer amaranth in Kansas and determined in greenhouse trials that numerous populations have evolved resistance to as many as five herbicide modes of action. Stahlman retired in February but still goes to his office to complete projects. He’s a fan of researchers living where they are investigating issues. He has bad news and (mostly) good news for agriculture. The good – The future is bright for students thinking about a weed science career. Those opportunities are caused by the bad: there are fewer and fewer herbicides that provide growers broad and easy weed management. Weeds will always be around, and weed control is essential to get as much production as possible out of a crop, whether crops or range, says Stahlman. “We unfortunately found in recent years if we don’t do things right or we get too lulled into doing the same thing, that weeds will evolve and develop resistance to herbicides we are using or just change their biology. They are able to evolve with production practices,” he notes. That topic has taken up much of his last 10 years. Glyphosate was used so much and was so effective, producers became reliant on the chemical. The alternatives also don’t have the same broad spectrum or effectiveness. That’s a dilemma for producers who face rising production costs, more complex weed control, and more emphasis on management strategies.